So, today is April Fools. Everybody knows things are going to happen, like someone claiming his dog has died.This isn’t always horrible. The horrible part is once a crowd of people believe him and feel remorse, he springs up with a chaotic smile, shouting, “April Fools!” Alerting the neighborhood of your hilarious ways is NOT the way to function, okay. Once in a while, somebody pulls off a great prank, but otherwise, STOP THE ATTEMPTED FOOLAGE. Foolage is not a word, but one day is will be. I am in an advanced mathematics class in which 13 members are currently in attending. Because we are so “advanced,” we believe in “special rules.” We get a significantly larger margin of leeway than other class. By leeway I mean how much crap the teacher takes from us. Anyway, we decided for April frolicking Fools the entire class (including me) would put their heads down on their desks and hold up a thumbs up sign. Once the teacher walked in, she instantly didn’t put up with it. She played her cards, stating that we’d all get no credit for the homework assigned. Hating zeroes, the class put up their heads and got out their homework. Noticing their/our plan didn’t work perfectly, we resorted to not talking the entire class. I am not kidding. WE DID NOT TALK THE ENTIRE CLASS. A direct quote from our teacher, “I can live with this.” The funny thing was that Sean, the teacher’s menace, still ended up disrupting class, using his calculator to type words and other candy. As Donatas (who was in the class) would have put it. “It disturbed my classroom experience.” The accomplishment here was that the teacher was able to teach a math lesson, communicate with us through hand gestures (Pretending to drink a beer bottle was the gesture for “May I get a drink of water from the water fountain.”), AND go through the whole class period without dying. All without the students using words. We all placed bet on that it was going to be either Anelise or Jeremy accidentally talking, but this fortunately did not happen. All in all, this was-and may be- the only day where a math class became a class with no words. Everyone in attendance is really laid back and awesome as a (insert awesome word). It takes place outside the heart of Pittsburgh of Western PA. I have to say anyone who likes anything would love it. If you’d like to know more, email me at zacharyneill@gmail.com. My very first newsletter is finally here. I know all 0 of my subscribers will be proud. What do we call them? Newsletters? Zewsletters? ZNletters? Zetters? Zews? 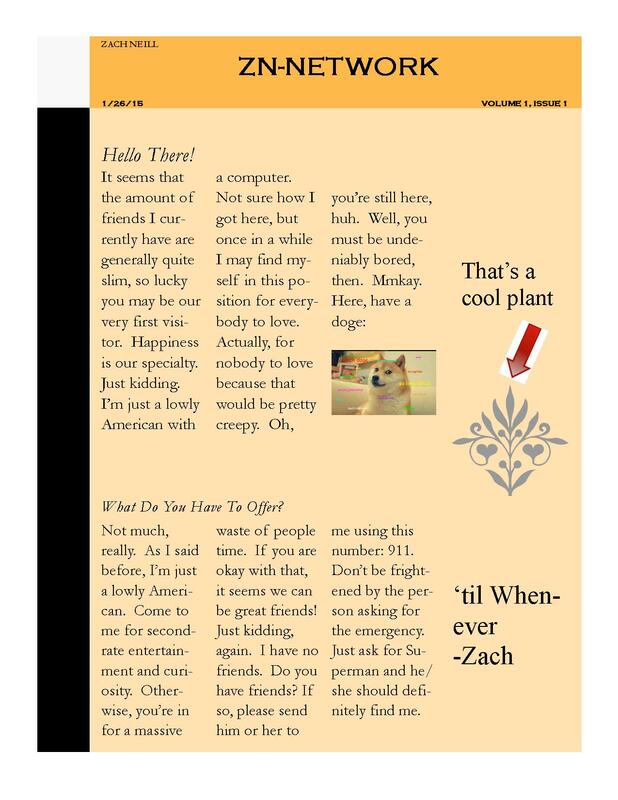 Let me know in the comments, all 0 of you, or at zacharyneill@gmail.com, whichever takes longer. 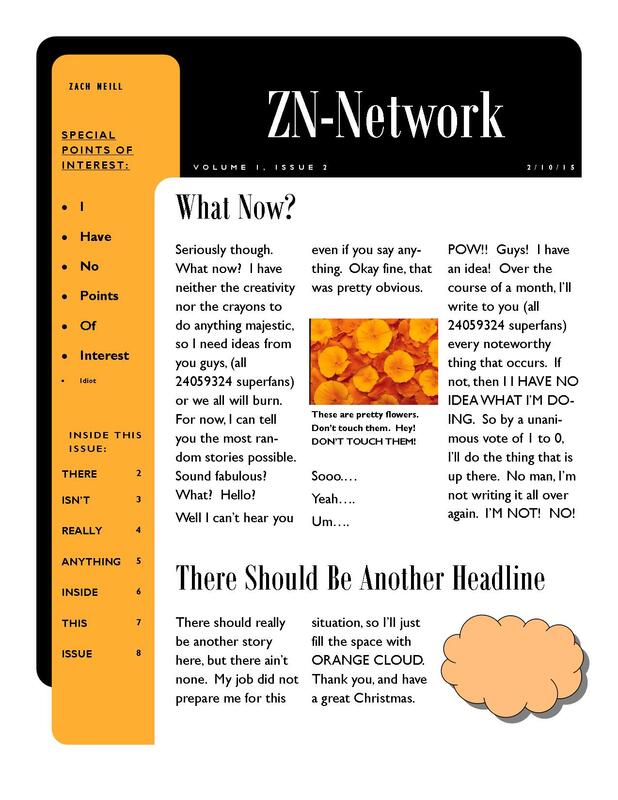 Click to follow Znnetwork and receive emails from ye on new or posts. Press for butterflies and rainbows.